Custom Imprints | Buy Gait Belts Direct And Save! Add your logo or name with a durable and colorful imprint. We are the only manufacturer to offer custom imprinting on each belt. Do You Need Just a Few Belts? 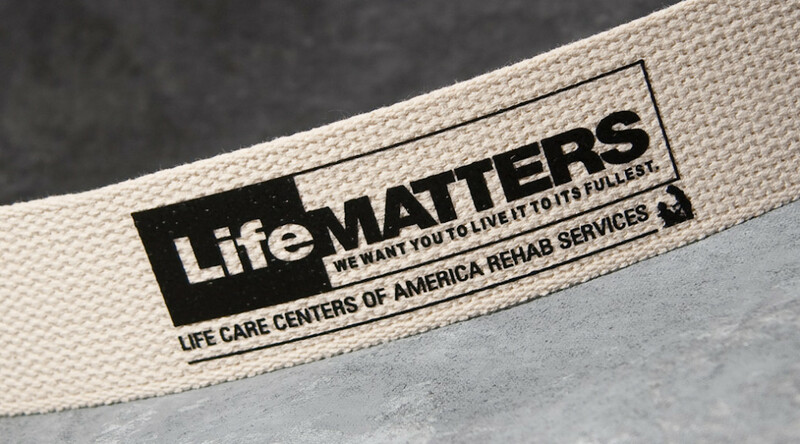 For Physical Therapy customers who need lower quantities of imprinted belts, we have a solution! Call 888-449-BELT (2358). Initial orders ship in approximately 6 weeks from the date we receive your approval on the imprint proof. Since we manufacture and package all of the belts in our facility, we will work out production schedules and options specifically suited for your organization. Download our imprint template for detailed instructions for your art production. We welcome your call at 888-449-BELT (2358)! Be sure to contact us with any questions you may have. Our gait belts are designed and manufactured in the United States. We are ISO 9001 Registered. View Certificate. © 2019 Peoria Production Shop • ISO 9001 Registered Our products are made in the USA.